Keiron Cunningham has revealed he won’t add to Saints squad unless he unearths a special player. Saints head coach says that while he still has a quota spot available he will not make a move in the transfer market for the sake of it. The Super League champions have made two astute signings during the off-season - stand-off Travis Burns and second rower Atelea Vea. But the canny Saints boss is refusing to fill the last remaining spot just because it is empty. “We’ve got a quota spot still there and if we can maybe free up a bit more money and something becomes available, you can never say never,” said Cunningham. “But it’s got to be the right person and the right player for this club and a guy that fits the bill. Cunningham has also revealed he is happy with his revamped backroom staff, having brought in former teammates Sean Long and Ade Gardner. “We’ll run with what we’ve got behind the scenes,” he said. “Obviously, Sean has come in and given everyone a real lift. I’ve got a really good team that’s full of experience and knowledge, and I think we’re ticking each other boxes as a team. 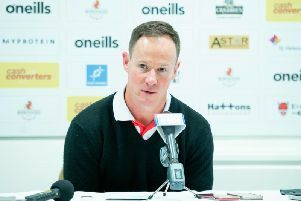 Cunningham is also hoping Saints don’t repeat the horrendous run of injury problems that at one point threatened to derail last season’s campaign. He believes influential duo Luke Walsh and Jon Wilkin will be fit for the season opener. “Jon Wilkin is now back in full training and Walshy is on track to meet his scheduled date,” said Cunningham.